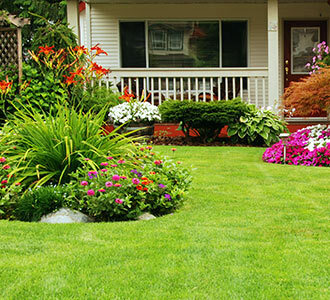 A lush, green lawn is something to take pride in. Whether you’re laying new grass or maintaining your existing lawn, contact the professionals at Greenbloom Landscape Design for information and assistance with keeping your yard healthy. A mature layer of grass that is removed intact with a layer of soil and brought to another location. 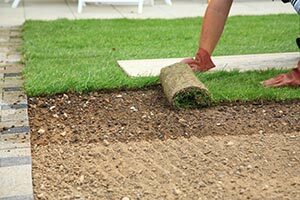 When Can Sod Be Laid? Spring for cool-season grass, any time for warm-season. Add your choice of organic material to help enhance the health of your soil. Rake the soil level and 1” below paved areas and any lawn sprinklers. Lay the first piece along a straight edge. Install additional pieces in a brick pattern. Use a roller to ensure adequate sod to soil contact. Consult a professional for large areas. Water daily for the first week. Water every other day during the second week. Water twice the third week and apply only one inch of water per week afterwards manually or through rainfall. Mow when grass is at least ten days old, or 3 inches tall. Gather the clippings and use a sharp blade. Seeds from various turf varieties of grass plants which have not yet germinated (begun to grow). When Can Seed Be Spread? Best to seed in early fall as weeds grow slowly and will compete less with the new grass. Spring is also a good time. How Do You Prep the Area? Use a hand spreader for small areas. Use a cyclone or broadcast spreader for larger areas. Overlap rows to ensure there are no bare spots. Water often but avoid making puddles to ensure moisture on seeds. Mow after two months, or when the grass reaches 3-3 ½“ high. Use a sharp mower blade. Dull blades damage your lawn by tearing up and weakening the grass. Adjust mower blade height to only cut top one-third of grass. Mowing too short makes grass focus on re-growing and not developing strong roots. Change the mowing direction each time. Grass will begin to lean in the direction it is mowed over time, and the lawn may develop ruts. Mow across slopes with a push mower to avoid falls and flipping a ride-on mower. Wait until grass is dry. Mowing wet grass can clog mowers and give an uneven trim. Be safe. Wear closed-toe shoes, use hearing and eye protection, and turn off the mower when unattended. Begin mowing in the spring. Make sure the ground is firm enough to walk on. Grass should be at least 2 inches tall to avoid injuring the grass. Your last mow will take place in the fall. Applying grass seed onto an existing lawn. Water your lawn in the morning to avoid excess evaporation during the day and prolonged dampness overnight, which promotes disease. Apply approximately 1” of water each week. 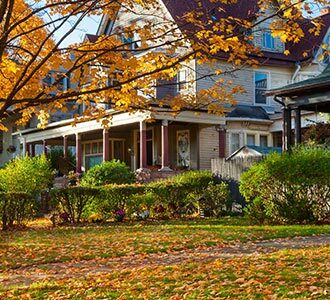 Rake your lawn in the spring. Use a plastic tool to avoid damaging new growth. Rake brown areas to remove matted and dead grass. Grubs: Nematodes will help control grubs. Pet damage: Keep pets away from this spot, and water it frequently. It will often recover. Also, Dolomite Lime helps to neutralize the acid in dog urine and restore the soil pH balance so it is more favorable to the growth of new grass. 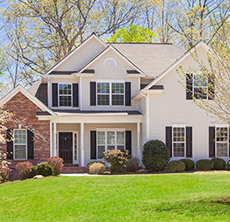 Brown spots: Aerate your lawn annually to reduce compacted soil. Dandelions: Mow higher, as tall grass helps prevent new sprouts. Also, apply herbicide. Lawn diseases: Many flourish in thatch, so remove the excess from your lawn. Mow lawn regularly to a moderate height. Clean lawn equipment after use to prevent spreading the fungus. Rake and remove any thatch more than ½” deep to improve air circulation and remove the breeding area for the fungus spores. Water grass early in the day so it has a change to dry before the heat. In extreme cases a fungicide may be necessary. Increase the amount of light to the area if possible by pruning tree branches. Reduce the amount of nitrogen in the fertilizer you use in shady areas. Water grass in the morning and infrequently but deeply to a depth of 6-8 inches. Wait until the grass is approximately 3” tall before mowing.